Mail4Rosey: It's Called the Better Bungee for Good Reason! That red one in the middle looks like just a normal bungee cord, doesn't it? But nope! That's certainly a bungee cord that is better than 'normal.' For starters it will withstand extreme temperatures, ranging from -60 degrees (let's hope you never have to be in that) to 200 degrees, F. It is resistant to oils, diesel fuel, SALT WATER (hurrah!) and most household chemicals too. We haven't had ours long enough to know if it's true or not, but it also promises not to break, crack or become brittle. Double hurrah because a lot of times these are stored outside! We also tested the Sych Cord (there are different styles and sizes of bungees for sale). It is a medium duty cord with a loop over one end. It's 30" long and perfect for using when 2 hooks won't work. It also works well in the storage room, or for help in organizing! 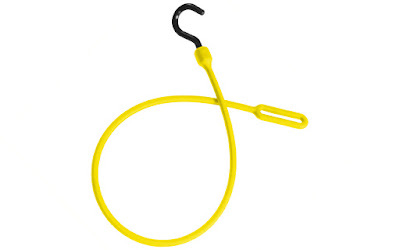 You make your anchor point by wrapping the cord around a bar or through a hole, the you place that hook through the loop, pull tight and secure the hook end. It works like a charm. This particular bungee has a 2x stretch and holds up to 50lbs of force. You can learn more about these two bungees, as well as others, by visiting the Better Bungee website. You can also follow along on Facebook and/or Twitter. I remember using bungee cords all the time on the boat as a kid. They came in such handy. These look like they would be ideal for the salt water we have down here. The Better Bungee sound so useful. I can see the Sych cord coming in handy too. We use bungees all the time. A good one is definitely worth its weight in gold! I use these all the time. I love these bungees and we love them. This would make an excellent gift for my son in law to use in the back of his truck! This one is really reliable and I love that it can withstand a good amount of pressure. It's perfect for trips especially when you're going camping. Wow, I haven't tried using a bungee. What a nice bungee, I wish I can buy one. That's awesome! I need one for sure. We use them all the time! My husband would like these. It seems we are always losing ours or in need of more. Wow good idea. I dont have any and I should get one. I am not a user of bungee. I had a friend who use such, I will recommend this to her. This sounds like really durable. I want to try this brand, perfect for our travels. We have never used a bungee cord before, but this sounds like a good add-on to have with you as it could help you during your long trip. Would love to get one sooner! I love how strong this is and how resistant. We use bungees a lot so it would be great to have a few. wow, I like this one compared to my regular bungees. I would love to check this out. Thanks for sharing!